Scheduled services will be permitted between Love Field and any destination in the 48 contiguous states. Scheduled international services and services to Alaska and Hawaii will not be permitted at Love Field. Love Field’s terminals will be consolidated and the total number of gates will be permanently capped at 20. Of the 20 new gates at Love Field, 16 will belong to Southwest Airlines, 2 to American Airlines, and 2 to ExpressJet Airlines. The 16 Southwest gates are very straightforward. Southwest already has firm plans for expansion at Love Field, which it has been touting a full year in advance of the lifting of Wright Amendment restrictions. Their campaign, “Nonstop Love,” has been plastered on every billboard along Mockingbird Lane, the airport’s primary access road. Earlier this year, they announced a slate of 15 new nonstop destinations that would utilize their 16 gates in the brand new terminal, which is set for completion just in time for the new services. The remaining gates, however, have been the source of much discussion and controversy. The ExpressJet gates will be operated on behalf of United Airlines. United has not yet disclosed its intentions for Love Field operations, so for now those gates are an unknown, but they are nonetheless secure. It is worth noting at this point that ExpressJet operates only short hops to Houston on behalf of United from Love Field, and they use only one gate, so I would expect that those gates will be used to either increase service to accommodate flights to United’s other hubs, or they will be leased to another carrier. Then there are the two gates belonging to American. American has not flown to Love Field in several years, and since their withdraw, Delta (formerly Northwest) has been leasing their gates to operate a single route. Until last year, this was a flight to Memphis, but since Memphis began to be de-hubbed, Delta shifted this route to Atlanta. If these routes sound a little funny, it’s for good reason; both routes fall outside of the Wright Zone. Delta skirted the regulations by operating CRJ-100/200 aircraft with only 50 seats; the restrictions apply only to aircraft with more than 56 seats. So what’s wrong with this arrangement in a post-Wright Love Field? Well originally there wouldn’t have been a problem, but the American-US Airways merger changed that. As a condition of the settlement with the Department of Justice, American and US Airways had to divest gates and slots at a number of key airports across the country, one of which is Love Field. In order for Delta to continue serving the airport, they would have to buy the gates from American. So why is that a problem? The DOJ expressed a desire that all divested assets from the American-US Airways merger go to low-cost carriers (LCCs). Delta, if there was any doubt, is not a low-cost carrier. This leads us to the battle for the two American gates at Love Field. To date, three airlines have placed bids for the gates, and DOJ will have the final say on who will be awarded the right to purchase them. A decision is expected in the next month or so to give adequate time for the winning carrier to establish its plans for the gates, but no firm decision date has been set. Since Delta already serves Love Field, the airline has no desire to be forced out, despite the fact that the airline also serves DFW Airport. They were the first carrier to place a bid for the Americana gates, and they are the only carrier confident enough in their ability to win that they have even begun selling seats on flights that they cannot guarantee will take to the air. Delta currently offers five daily round trips to Atlanta using CRJ-100/200 aircraft. Their bid for the available gates states that they would increase service to 22 daily round trips to five destinations. Three daily roundtrips each to Detroit and Minneapolis-St. Paul would be operated by CRJ-900 aircraft, five daily roundtrips each to New York (LaGuardia) and Los Angeles would be operated by E-175 aircraft, and six daily roundtrips to Atlanta would be operated on mainline 717 aircraft (ironically enough from Southwest-owned AirTran). These flights will offer a total of 1,876 passenger seats per day, of which 264 would be in first class (all three aircraft types have 12 first class seats). 1,216 of these seats would be on regional aircraft, which are notoriously less comfortably than mainline aircraft (particularly the CRJ-900). 22 flights a day out of only two gates is a very tight squeeze, and if you look at the actual schedule of these flights, it will be immediately obvious that it is untenable. There would be turnarounds of mainline aircraft in only 10 minutes. The new Love Field regulations are not particularly tolerant of irregular operations, so this plan would definitely have to be revised very quickly after being implemented. The DOJ responded to questions about Delta’s standing to request the two American gates by stating that “divesting assets to Delta would fail to address the harm arising from the merger and would be inconsistent with the goals that the remedy seeks to achieve.” In short, the DOJ is not considering Delta’s proposal because it is another network carrier, rather than a LCC. True to form, Delta responded with a classic argument; that is, if we cannot have the gates, then no one can. Although they are leaving their original bid on the table for consideration, Delta now proposes that the gates be returned to the City of Dallas to be set up as common-use gates for multiple airlines. That would allow Delta to continue its current services to it’s primary hub of Atlanta, and perhaps add another flight or two, and it would also allow other airlines to offer limited services to the airport. The American branch of Sir Richard Branson’s airline concept is also competing for the two divested American gates at Love Field. Like Delta, Virgin serves DFW Airport; unlike Delta, however, Virgin has never flown to Love Field. Another critical difference: Virgin is proposing to relocate, not supplement, its current DFW operations. Virgin currently offers three flights per day to each of its California hubs, San Francisco and Los Angeles. According to Virgin, this is the largest risk that they are willing to take at DFW. But now that gates have come available at Love Field, the game has changed. Virgin is proposing to turn Love Field into its third hub, offering 18 daily flights to five destinations: four daily round trips each to San Francisco, Los Angeles, New York (LaGuardia), and Washington (Reagan), and two daily round trips to Chicago (O’Hare). Virgin offers mainline service only, so all flights would be operating using its A319/20-series aircraft. What that means, in comparison to Delta, is that there will be far more seats available, despite the reduced number of flights. 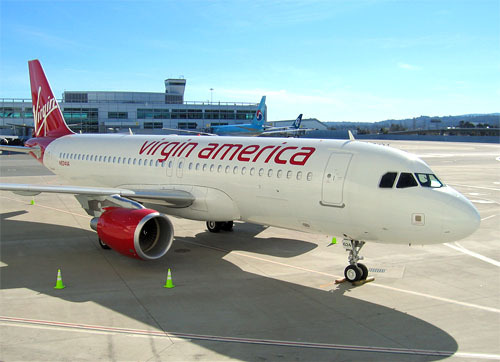 Virgin has not said which aircraft types will be used on which routes, but even if every flight were to be operated on its smallest aircraft, the A319, they would offer 2,142 daily passenger seats. If all flights were operated on their higher-density configued A320, then they would offer 2,682 daily passenger seats. The reality will likely be somewhere in the middle. 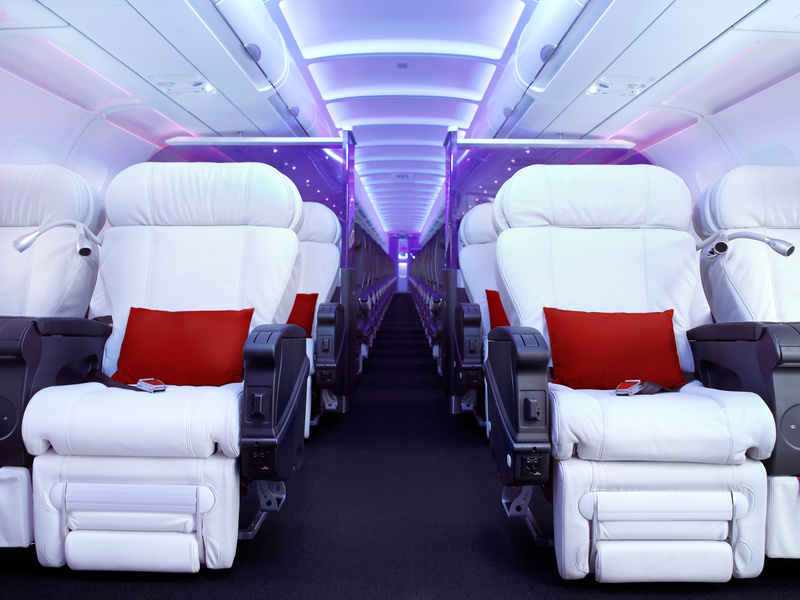 In any case, all VX aircraft are outfitted with 8 first class seats, meaning a daily offering of 144 seats. The challenge for Virgin is that their route network is still in its infancy. The airline only began operations in 2007, so it has a great deal of growing to do. It looks like management has set their sights on Dallas as a prime location to develop the network even further. Virgin offers mainly flights within and between the two coastal regions. There are presently only three destinations in the middle: Chicago, Dallas, and Austin; all three of these cities offer service only to the airline’s west coast hubs. Their proposal would make Dallas the only city in the middle region to have eastbound service, and it would capitalize on the airline’s newly won slots at both Washington Reagan and New York LaGuardia airports, both of which will be served by Southwest from Love Field as well, regardless of whether they win the additional gates. In fact, Southwest will serve all of the same routes as Virgin except San Francisco, which Southwest would serve if it won the gates. It sounds like a recipe for healthy competition. And then there is the player with the home field advantage. As it turns out, being the home team may not prove to be an advantage. Southwest is currently the primary carrier our of Love Field, which also happens to be adjacent to its headquarters. As it stands, Southwest handles 96% of the passenger traffic at Love Field. The question for the DOJ is whether or not that makes sense considering that the reason for their oversight is the desire for increased competition. They also expressed a specific interest in adding new service. Southwest’s answer to this has been an onslaught of new service out of Love Field. It’s important to note, however, that the vast majority of new services that Southwest is offering are unrelated to the two extra gates that they are targeting. 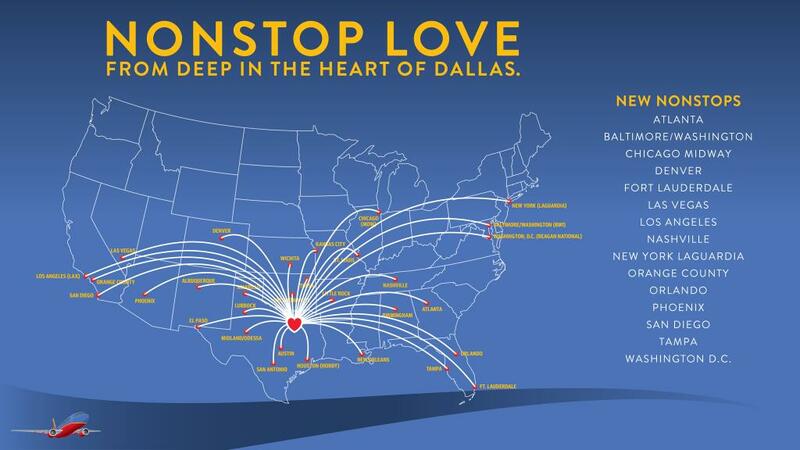 If Southwest wins the two extra gates at Love Field, it has said that it will add 20 new nonstop destinations, 12 of which will be new destinations for the airline. This is a very ambitious plan, especially considering that it is offering a greater number of new destinations than Virgin is offering flights. Because it already has 16 additional gates at the airport, these additions will be tied to other expansion plans, so even if Southwest does not win the gates, some of these destinations will likely be added at a later date after they have finished their trial of the increased capacity and new facilities. As it stands, they will be operating below capacity for its 16 gates. Furthermore, adding so many destinations would mean that each would be served by a small number of flights, probably only one a day to most of them. For a carrier that offers a seemingly limitless combination of indirect and connecting flights, a single daily nonstop flight isn’t particularly valuable in its own right. 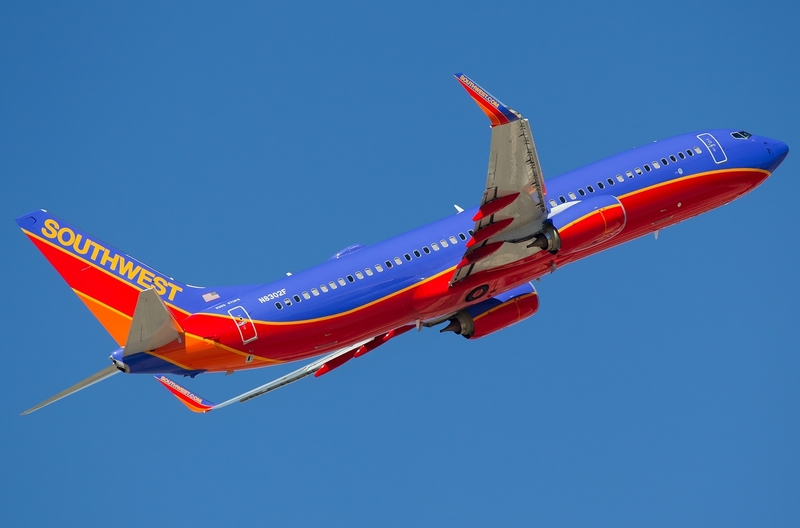 Southwest has not announced all of the destinations it plans to serve with the two additional gates, but they will include Charlotte, Charleston, Detroit, Indianapolis, Memphis, Minneapolis, Newark, Philadelphia, Raleigh/Durham, Sacramento, San Francisco, and Seattle. That leaves 8 mystery destinations that will be revealed at a later date, assuming the bid is successful. Based on the small variation of the number of seats on their 737 aircraft, Southwest would be able to offer approximately 2,800 additional daily seats from these two gates if each new destination were to receive one daily flight. Southwest is nothing if not egalitarian, so there are no premium seats to be had across the fleet. Southwest has been very quick to point out at every opportunity that they are the only airline that is restricted to the extent that they are. In their view, Love Field and DFW are essentially equivalent for any other carrier, and so any new competition can simply operate out of DFW, whereas Southwest is effectively bound to Love Field. They aren’t exactly incorrect about this. According to the revised terms of the Wright Amendment, for every gate that Southwest acquires at DFW airport (of which it has none), it must give up a gate at Love Field, so to expand beyond 16 (or potentially 18) gates, Southwest would have to relocate its entire operation to DFW. That being said, Southwest’s route network is designed around connecting and indirect services, and they turn aircraft around faster than almost any other carrier, meaning that they can do more with less than almost anyone. In any case, virtually all traffic currently operating out of Love Field is on Southwest metal, and that is not in danger of changing. With the end of the Wright Amendment, Southwest is set to unveil an additional 20-25 new nonstop destinations beyond the existing destinations within the Wright Zone. No matter what happens with these two additional gates, Love Field will remain a Southwest stronghold, and Southwest’s frequent fliers will definitely be happy with increased services with fewer connections. Thanks to the recent statements from the DOT, it appears that it is a two horse race for the two open gates at Love Field. Delta is essentially out of the running, so Virgin America and Southwest will be squaring off to take control of them. Both would be adding service to the metroplex: Southwest would add destinations and frequencies, while Virgin would add competition to the airport in the metroplex that currently has virtually none of it. My guess is that the DOT would favor Virgin for the two open gates, since the 16 gates Southwest already has access to constitute an expansion in their own right. I also don’t buy the doom-and-gloom outlook that Southwest is working hard to portray. While it is true that the revised Wright Amendment “permanently” caps Love Field’s gate capacity at 20, that restriction is only as permanent as the legislation. The original Wright Amendment was seen as permanent, and yet it was continually revised over the decades to become what it is today, and although this alleged repeal (or more accurately substantial reconstruction) is a major milestone, there is no reason to believe that it will be the final incarnation of special regulations for Love Field. As the metroplex continues to grow, the need for air travel capacity will increase, and Dallas travelers will place pressure on legislators to again expand Love Field. If you ask me, I think we can expect to see the return of what is now terminal 1 at Love Field in about 7-10 years, at which point Southwest will take over the entire current terminal and its 20 gates, allowing Virgin to turn Love into a larger hub as well, and increasing the number of airlines permitted to serve the airport. I imagine a second terminal would include 8-12 gates. Further down the road, we may see international service, though I imagine Southwest would shy away from footing the bill for expansions of that sort since they are pouring millions into a new international terminal at Houston’s Hobby Airport. Virgin, however, would probably like the option to offer flights to Latin America from a Texas base to supplement its offerings from Los Angeles and to attract customers from the east coast. There remains one more substantial unknown in the Love Field equation. In addition to Southwest’s 16 gates and the two up for grabs, there are still two more gates at Love. ExpressJet owns the gates and operates them on behalf of United. The legacy carrier and its primary regional subsidiary have been notably silent on the issue of their future operations at Love Field. As it stands, they currently operate on the same scale as Delta, using a single gate for a single route to their nearby Houston-Bush hub. We could see a substantial increase in traffic by United, but I imagine that if it were to be a huge expansion, then they would have hinted at it by now. There may be a chance for either Delta or Southwest to lease one of the two ExpressJet gates in order to continue or expand services. There remains a great deal to be seen, but I would love to find Love Field thriving with nearly all-mainline service from four different carriers. For now, that remains a pipedream as the battle for Love Field is certainly not over just yet, and no one is giving up without a fight. I like your comments about future expansion of gates at Love. A 32 gate limit should have been allowed in the first place. If it were, everyone could have the gates they need to expand with healthy competition. As it stands right now, the big picture regarding competition is actually a net REDUCTION in competition from Virgin. They will completely exit Philadelphia (the main hub of legacy USAir) and DFW, the fortress hub of AA, then redeploy their assets at Love. This has been a back room setup all along between Virgin and American to make Virgin go away from Philly and DFW to eliminate competition for American. Virgin’s top 2 executives are former CEO & senior exec. of AA, and while with American, fought hard to preserve the Wright Amendment, now they are changing their tune.